We, at BESH Knives are continually refining our process to get the best possible knives, through materials and geometry, into the hands of the people that need it and your support of this endeavour is greatly appreciated. Since 2000, I have received great interest and support for the BESH Wedge® from personnel and agencies worldwide, therefore, that is where I am exclusively focusing my efforts. I am proud to introduce my new line of handmade XSF tools. I have put years of passion, research, and real world experience into these designs. All our XSF tools are handmade from high quality steel, G-10 scales and custom handmade Kydex sheaths. In keeping with my love of design and for getting great mission specific tools to the personnel that require it, I have collaborated with Jeff Diotte of Diotte Knives and Eric Noeldechen of On Scene Tactical to produce this line of handmade tools. Each piece is handmade by Jeff and the sheaths are produced by Eric. All XSF tools are extremely sharp. 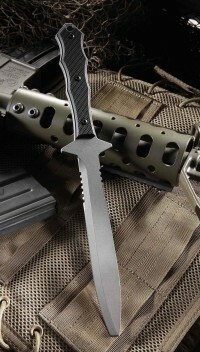 If you are looking for pry-ability, the XSF-1 is your tool of choice. For increased cutting performance due to its higher grind line, the XSF-2 is the geometry for you. Each piece is made from 3/16th 440c stainless steel, 5/32nds" G-10 scales and a 0.90” Concealex™ sheath. All sheaths include Molle™ attachments and belt loop. The Micro also includes chain. See ORDER page for the complete details.